Tens of thousands of books are needed in support of a Guinness World Record attempt to create the “Longest line of books” at Southern Illinois University Edwardsville. In conjunction with International Literacy Day on Friday, Sept. 8, organizer Stephen Hupp, PhD, professor of psychology in the School of Education, Health and Human Behavior, invites the public to help accomplish the amazing achievement which will take place on campus near the Early Childhood Center. The current record was set in 2016 with a line of 13,410 books that stretched 1.4 miles in the United Kingdom. According to Hupp, the donated books from the world record attempt line will be given to children in local Head Start programs. This massive contribution will support his ongoing Kid Books Project, which aims to collect one million books for children in local Head Start programs, ages five years and younger. Donations can be mailed to or dropped off at the SIUE Department of Psychology, Alumni Hall room 0118, Edwardsville, IL 62026-1121. It will help organizers if the books come pre-counted by Sept. 7 in advance of the Sept. 8 attempt. The Edwardsville Public Library is also serving as a drop-off site. Any individual or group donating at least 2,500 books can be considered a co-sponsor of the record attempt. Organizations helping coordinate the event include the SIUE Psychology Club, Psi Chi, the Head Start Social-Emotional Wellness team, and the Clinical Child and School Psychology graduate program. For more information, contact Hupp at sthupp@siue.edu and find updates on Twitter @StephenHupp. 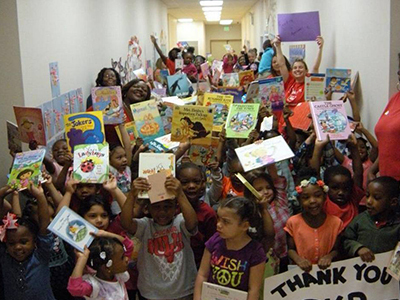 Photo: Children in the SIUE Head Start/Early Head Start Program happily display books that have been donated to them.